Eastleigh’s first home pre-season friendly of the summer at the Silverlake Stadium saw the Spitfires play host to a young Reading side. In the opening ten minutes, Tom Jordan saw his looping header fall narrowly the wrong side of the Reading goal from a deep Ian Herring free kick. The visitors looked lively particularly on the flanks with Jordan Obita and former Southampton loanee Michail Antonio providing pace and width. In the 11th minute, Obita’s dangerous ball across the face of the Eastleigh penalty area only narrowly evaded a finishing touch in the centre. Eastleigh’s Andrew White showed a lot of good touches and promising play for the hosts and was the stand out player of the first half. Jamie Slabber curled a free kick over the bar from 25-yards after a quarter of an hour before Reading threatened from a corner kick, which Eastleigh scrambled away. John Goddard then had a low shot saved by Eastleigh goalkeeper Jamie Banasco-Zaragoza soon after. The opening goal of the game came in the 19th minute when JORDAN OBITA provided a neat close range finish to hand Reading the lead. After conceding, Eastleigh hit back with three goals in the space of ten minutes by playing some good football and being clinical in front of goal. ANDY FORBES popped up with the equaliser after Jamie Brown’s free kick wasn’t dealt with by the Reading defence. Jamie Slabber picked up on the loose ball and squared unselfishly to provide the assist from the left-hand side of the penalty area for Forbes to finish. Sponsors man of the match ANDREW WHITE then doubled Eastleigh's advantage by rounding off a well-worked move from the hosts. Slabber was involved in the build up by playing a through ball down the right for Jamie Davis to execute a pinpoint cross from the wing. The former Reading academy player White finished well with a header to beat the keeper. 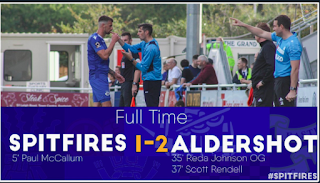 Eastleigh extended their lead further to open up a two-goal cushion when JAMIE SLABBER found the net with a fine left-foot effort in the 32nd minute. Slabber expertly slotted past Simon Locke in the Reading goal with a cool finish with the outside of his boot from a tight angle to the left of goal. Prior to Eastleigh’s third goal, Sean Morrison had a header cleared off the line for the visitors. Towards the end of the half, Jacob Walcott squeezed his way through the Eastleigh defence and looked to have wrong-footed Banasco-Zaragoza, when Jordan Wells-Gardner intervened to deny a goal by making an important deflection. 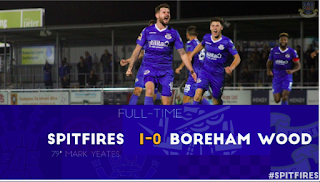 The Spitfires held a well-earned lead at the break and provided plenty to cheer about, none more so than three well-taken goals. Reading took to the field with a different outfield team having made ten changes at the break. Similarly, Eastleigh also made wholesale changes to give as many players as possible the chance to impress manager Ian Baird. The Royals started the half well with Gozie Ugwu forcing a save out of Banasco-Zaragoza in the 48th minute before Jake Taylor fired a shot wide of goal following a low cross from Nicholas Bignall on the left hand side. GOZIE UGWU reduced the deficit for Reading when he poked the ball into the net from a couple of yards to make it 3-2 with around ten minutes of the second half played. Nicholas Bignall then drove a low shot just past the far post before Eastleigh were forced into making a change when left-back Jordan Wells-Gardner pulled up with an injury. Chris Mason came on in his place, whilst Andy Forbes and Jamie Brown were asked to play in unfamiliar territory – left-back and centre half respectively. To their credit, both Forbes and Brown did well playing out of position as Reading didn’t score another goal and they effectively kept a clean sheet after the forced tactical changes. Their experience shone through and their performances were commendable. Jake Taylor provided the biggest threat to Eastleigh’s back line and saw a speculative chipped effort fly narrowly over the bar in the 66th minute. Taylor’s excellent defence-splitting pass then fed goal scorer Ugwu clean through on goal in the 72nd minute only for a combination of a weak effort and Banasco-Zaragoza doing well to thwart the striker. The Eastleigh goalkeeper won the one-on-one situation by racing off his line and standing tall. Another of Eastleigh’s trialists, Troy Powell-Quarry, took the chance to shine with both hands by putting in a solid second half performance in attack for the Spitfires. The youngster, who has previously played for Maidenhead United and Hayes, showed a good eye for goal and was not afraid to have a go from distance. In the 76th minute, Powell-Quarry’s fine solo effort forced the Reading goalkeeper into a strong diving save to tip his shot around the post for an Eastleigh corner. A minute later, Nicholas Bignall lofted the ball over the Eastleigh goalkeeper with a deft touch, but it didn't quite have enough power to roll over the line as Tom Jordan swept up to clear the danger. Eight minutes from time, Powell-Quarry showed neat footwork and close control to work room for a curling shot from a long way out that wasn’t too far away from finding the top corner. 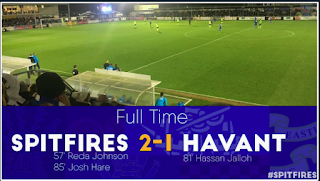 Reading came close to a third goal from a corner in the closing stages but Eastleigh held on to secure victory in this friendly, which proved to be a valuable exercise for both teams.